Now that everything is well set and it is time for you to venture into beekeeping, what are some of the things you need? Well, to be a beekeeper you do not need a lot of skills or experience, anyone who can garden can become a beekeeper. 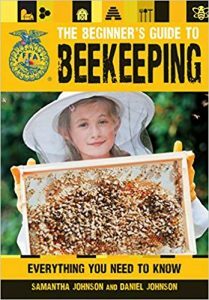 You only need to understand all that is required then soak yourself up in all the useful information available for beekeeping. Additionally, it’s very important to choose the right beginning beekeeping supplies. Beekeeping is perhaps one of the most unexploited opportunities globally. The demand for honey far exceeds its supply and that is precisely why beekeeping is can be a lucrative businesses. If you are not interested in the money and want to do it as a hobby, then you will find tremendous joy doing it. Furthermore, bees help in pollination and this is essential for your flowers, vegetables and garden plants. Before you begin, you need to understand where you will keep your bees. Check out whether you have enough space in your backyard and also consider your neighbors, backyard, and zoning rules and regulations. Backyard should be big enough – a tenth of an acre can accommodate a single or two colonies depending on how the backyard is used. Zoning regulations – it should permit you to keep bees. Family members – let them know bees are coming, check out whether anyone is allergic to bee stings and remedies available. Neighbors – ensure it does not create problems with your neighbors. This depends hugely on your location. It is good to generally start your hive during early spring, that is, late March and early May. Nonetheless, carry out research about the ideal time to start your hive at your specific area. You have several options when it comes to getting your bees. One of the best seasons to catch bees is during Spring. Failure to catch them at this time will affect the bees since they may lack sufficient forage for collecting their food, pollen and honey. This is ideal for those who are using Langstroth hives. The nucleus colony simply refers to a fully-established or self-sustaining colony in a 5-frame box. You can transfer this colony into your 8 to 10-frame boxes. It generally takes a shorter time to build up your bees since the nucleus colonies already have combs, honey stores, eggs, and larvae. You can get a nucleus colony from local farmers or even search the internet for foundation less beekeeping, and many others. You can lure a swarm of bees using bait and traps. Your lure will attract a colony which can then be moved into your hive. This choice is one of the best ways of getting hearty local bees. You can get some plans on how to build bait hives and swarm traps then build your own lure. Any local farmer can help you catch a swarm of feral bees but still you can do it yourself. The major advantage with swarm bees is that they are hearty and have adapted to the climate. They are also strong enough since they have moved out from a strong colony. It is easy quite easy to catch swarming bees once you understand how to catch them. You can buy a package from a breeder. The package will be shipped to you and this takes a short time depending on how far you may be from the breeder. There are many suppliers many there and thus this option is an easy one. Once you have identified your source of bees, then it is time to procure your bee hive. The bee hive is the honeybees’ home. There is no beekeeping if you do not have the bee hive. You have various options to choose from when considering a beehive. The Langstroth hive is a popular choice. The beehive components are also critical when considering a hive since you may have to replace these accessories at some point in time. Standard Langstroth hives makes it easy for the beekeeper to replace or expand the size of their hive. There are literally dozens of bee hive brands and types out there and therefore you have to choose an option that suits you best. This will be affected by your budget and personal preference. You also have to go for either assembled or unassembled hive. Some of the places to get a hive include: online stores such as E-Bay, Amazon, or local bee suppliers in your area, and many others. While purchasing your hive ensure, you choose an excellent quality hive since bees are highly sensitive to any slight discomfort. Hive outer cover – helps protect the bees from changing weather. Inner cover – provides insulation and prevents the bees from attaching comb to the outer cover. Shallow honey supers – the surplus honey is stored in the shallow honey supers combs. This is the honey usually harvested. Queen excluder – lies between brood nest and honey supers. Helps separate the queen and prevent her from laying eggs in honey supers. Not usually used when two hive bodies are in use. Brood chamber – also referred to as hive body. It can hold up to 10 frames of comb. The brood nest is situated in this space and this is where the brood is reared and honey stored. A single hive body can act as a brood nest but in cold areas two hive bodies are popularly used. Bottom board – the hive rests on a wooden surface called the bottom board. The bottom board is set on bricks of concrete blocks so as to keep the hive off the ground. Foundation and Frames – these hold beeswax or plastic foundation. They have hexagonal shape imprints. Hive stand – used for keeping the beehive off the ground. Helps keep the bottom of the hive dry and prevents insects and other invaders from venturing into the hive. An elevated position also helps insulate the hive. There is a great disparity between the standard and the Flow Hive. The former has been around for many years but Flow Hives only came into the picture just a few years ago. The Flow design has currently created a buzz the world over. It is a special type of hive that allows the extraction of honey directly from the hive without an extractor. The traditional bee hive boasts a simple design. It is made up of various interconnected parts, all of which contribute towards creating a good home for the bees. At the top is an outer cover that helps keep the bees secured from elements of nature such as direct sunlight, wind, and rain. Second is the inner cover that helps create a space of dead air that helps insulate the hive. It also ensures the bees do not attach combs to the outer cover. The queen excluder for keeping the queen in the right place. The hive body where brood nest for rearing brood and honey storage is available. A bottom board that holds the hive. Honey supers for storage of surplus honey. A hive stand for keeping the hive off the ground. The highly sophisticated Flow Frame is where the Flow Hive derives its name. This unlike the frame of the standard hive comes. The Flow Frame comes with plastic foundation in addition to formed cells that open when turned on to drain the honey into the collecting jar. The design of the hive is pretty straightforward and it is easy to know when the Flow Frames are full of honey thanks to the observation window that comes with the hive. Flow Frames that can be used in standard Langstroth hives. Flow Super also designed to fit into a standard hive is available. Complete Flow Hive which comes with its flow frames and flow supers. The hive is available in cedar or pine material make. It also has other components found in a standard hive including: screened bottom board, inner cover, roof, and many others. The design of the Flow Hive is technological sophisticated whereas the one for traditional one is simple. With a Flow Hive, you are able to harvest honey by a simple turn of a key. With a standard hive, you need to use a bee smoker, remove the frames, then place them in an extractor in order to get the honey. You never disturb the bees during honey harvesting when using a Flow Hive. With a traditional hive, you regularly have to open up the hive, which disturbs the bees. For a traditional hive it is easy to inspect all parts of the hive. 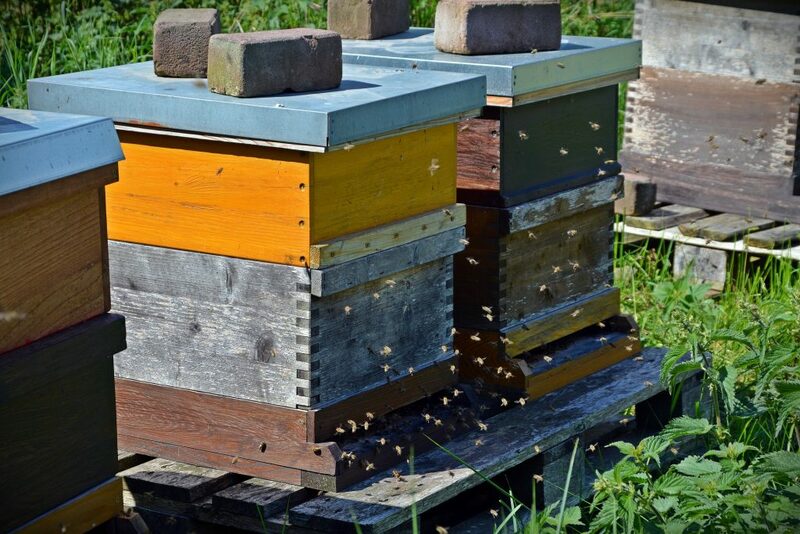 The Flow Hive is a closed system which means they are prone to mites and other hive pests. Those who want to interact with the bees may find it difficult to achieve that when they install a Flow Hive. The traditional hive allows the beekeeper to get close, watch, and learn from and about the bees. The Flow Hive when blended with the traditional design manages to bring out a hive that offers benefits of both worlds. Check out BeeKeepClub’s rankings of the best beehives available to get you up and running. These will help keep your face and entire body protected from bee stings. You should get an excellent quality jacket with veil in addition to gloves. Ensure the protective gear is comfortable even during hot weather conditions. A ventilated bee suit would be the best option, so you can keep cool while wearing the suit. Bees are drawn to the face of mammalian intruders and hence the need for a jacket with a veil. The honeybee antenna has carbon dioxide receptors that help them detect the air exhaled by mammals and attack. This defense mechanism helps bees to secure the hive from bears and other animal intruders. The receptors are also highly sensitive to heavy breathing and hence the reason why anyone who is nervous with bees is more prone to attack. You will also notice that more experienced beekeepers rarely use protective gear when handling bees. Their calmness when in the presence of bees does not signal the bees to attack them. However, as a beginner, always use protective gear when working with bees. The hat and veil will help protect your face from attack. A bee sting on the eyeball can render you blind and one on your lip can give you an ugly face for two or three days. There are also those that are fatally allergic to bee stings who should really avoid getting stung at all costs. Plastic hats are a popular option among beekeepers. The hat will help protect you from sunlight during hot days as well. The gloves also help protect your hands from bee stings. However, not everyone likes working with them. Those who dislike gloves do not wear them since they want to maximize their ease to maneuver. You have various options to choose from when selecting an ideal pair of gloves. Thin leather gloves are a popular choice among beekeepers since they are light and comfortable to wear. Remember bees are highly sensitive to fear and will pick up on fumbling or shaky hands. Thus it is wise to use gloves if you are a beginner. Check out BeeKeepClub’s rankings of the best ventilated and sting proof bee suits available to get you up and running. The honey extractor forms a part of the must-have beekeeping equipment. It is used for safely collecting the honey from the combs without destroying them. There are various kinds of honey extractors in the market. 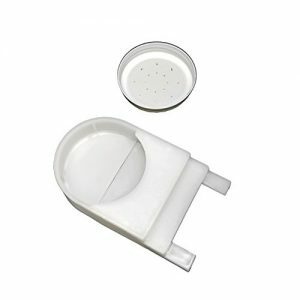 You can go for stainless steel extractor of choose one made of plastic. Plastic extractors are not so popular since they may not last longer as the stainless steel honey extractor. The stainless steel unit is stronger, food safe, and longer lasting. The capacity of the extractor also varies: 2 frame, 3 frame, 4 frame, 6 frame or even a 10 frame extractor. It is therefore important to consider the size of your operation before you buy a unit. If you purpose to scale up from a single hive to two or more in the future, then it would be wise to choose one that can grow with your business. 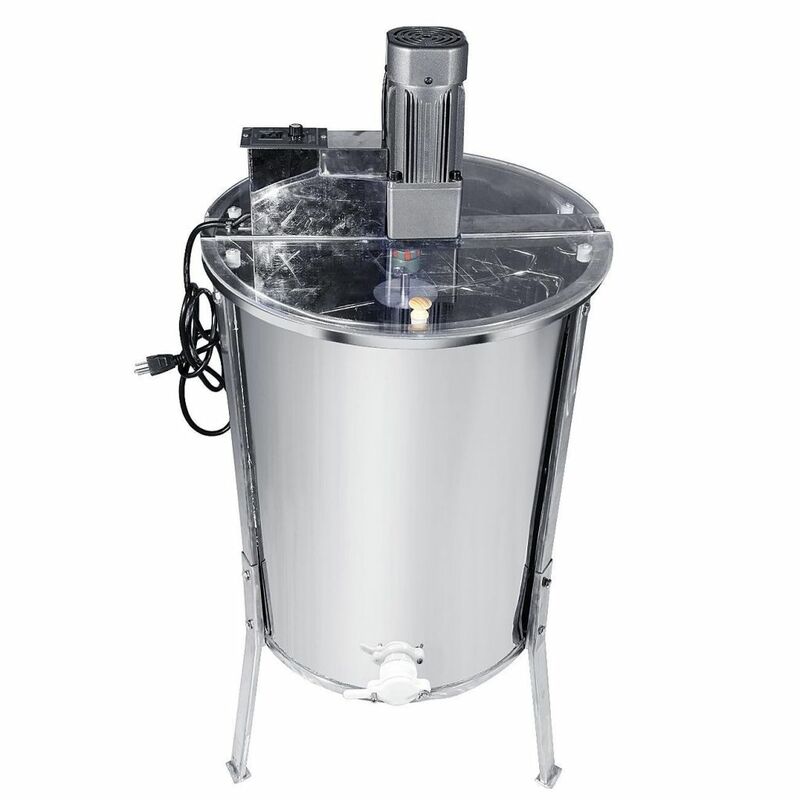 Most beginners and hobbyists choose the 2 frame honey extractor maybe due to the fact that it is moderately priced or is sufficient given the amount of work to handle. The honey extractors maybe purchased as brand new or pre-used. It is however difficult to get a pre-used medium size honey extractor. The honey extractor spins the honey combs through two mechanisms: radially or tangentially. The tangential extractor spins the combs one side at a time. The frames will then be removed flipped and spun once more. The tangential extractor is cheaper when compared to the radial extractor. The radial spins the frames and removes the honey from both sides of the frames at a go. You therefore load the frames only once. This type is priced highly given the convenience and efficiency it offers over its counterpart. You might also have to choose between a manual or electric honey extractor. Both of these can do a good job but with the electric one you do not strain when spinning the frames. One in particular that has a motor speed control can make the best choice since you are able to regulate the extraction process. You can begin slowly then speed up. Upon completion, you can also reduce the speed drastically. Anyone planning to rear bees should think of a honey extractor. These tools are required since honey combs are very delicate and take time to build. It is therefore only human for the beekeeper to ensure the honey is extracted in a manner that does not damage the frames. This not only benefits the bees but it also helps boost the yield from the hives in a season. The extractor is available as either manually operated or electric unit. Each of these has their share of pros and cons worth mentioning. Comes with an in-built crank and does not require electric power in order to be functional. Best suited for areas prone to power outages or remote areas where power is limited. Not expensive when compared to electric units. Offers the user full control of the entire process since the speed is regulated by hand. You might need assistance at times to keep the unit stable when spinning. Less efficient. Its efficiency depends on your spinning speed. Perfectly suited for heavy spinning work. The unit will only stop when you switch it off and not when you are exhausted. Some models have variable speed motors which can be a huge advantage to the beekeeper. Highly priced unlike manual extractors. Require electric power to operate without which it becomes useless. Check out BeeKeepClub’s rankings of the best honey extractors available to get you up and running. 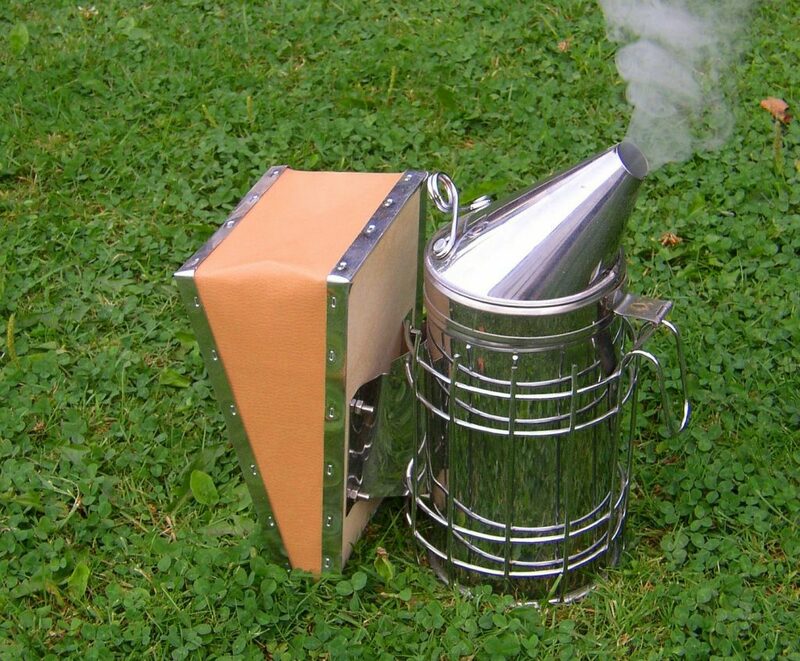 The bee smoker is used for making the bees docile since they are very sensitive to smoke. 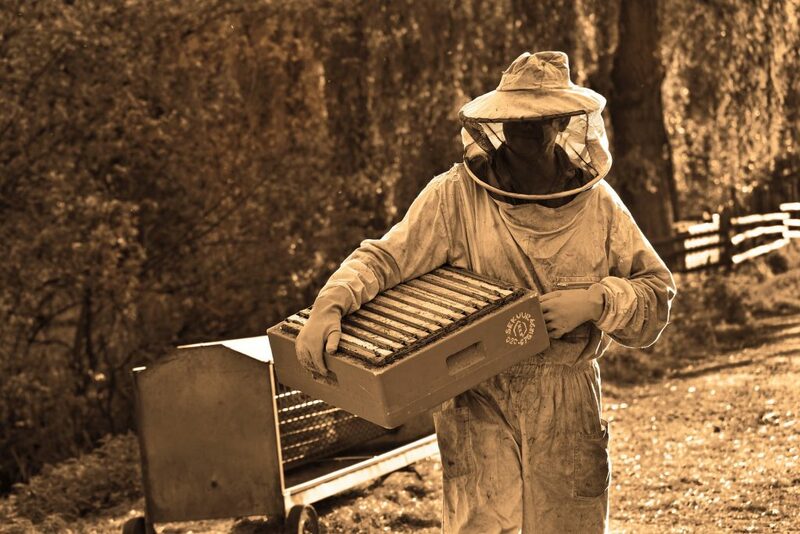 The smoker will help make your work easier when you are inspecting the hive or moving it somewhere else. The psychology behind the use of smoke to lull bees is that bees believe there is a wildfire when they are exposed to smoke. Once they feel there is a fire breakout, they gorge on honey in preparation for relocation. A full stomach in bees makes them docile and less likely to sting since they find it hard to tip their abdomens when they want to sting. Another thing that makes the bee smoker useful when handling bees is the fact that smoke helps masks the alarm pheromone in bees. This is a substance usually produced by the guard bees when sending signals in order to launch an attack. The pheromone produced by bees usually smells like banana candy and you can use this as guide when you need to puff in more smoke into the hive. Interestingly, bees also perceive the smell of bananas as a signal for attack. Therefore, you should not eat bananas when you intend to work on the bee hive. The smoker is usually made of stainless steel material and has a heat shield and grate in its lower side. You have a number of options to choose from when it comes to smoker fuel. Pine needles, corn cobs, wood pellets, dried grass, and burlap make excellent smoker fuel. You should also ensure what you use has not been treated with chemicals since this can harm bees. Since the bee smoker is made of metal, they get extremely hot when in use. It should therefore be handled cautiously when in use and during storage. It is also important to avoid overloading the smoker during lighting. You should also be careful with the flame that usually comes out through the smoker when lighting. This can burn your hands or the protective gear. The smoker billow should also be squeezed gently when smoking the hive so as to avoid pumping fire into the hive. One may wonder whether smoke is harmful to bees or not. Fortunately, smoke does not hurt bees. However, too much of it may be harmful. It is easy to know how much smoke is enough for the bees; after a few tries one can know how much to use. You can also use the smoke to drive away bees when you get stung. A stinger attracts more bees but when you smoke the affected area it becomes hard for the bees to feel the stinger. In terms of price, choose a smoker that is affordable and useful. Too expensive smoker does not necessarily mean a better one. Check out BeeKeepClub’s rankings of the best bee smokers and bee smoker fuels available to get you up and running. This is essential for inspecting the hives and adding new boxes. The bees use propolis, a resin-like substance to glue almost everything together within the hive. It therefore proves to be a challenge when you need to check out the hive or when you want to harvest honey. The hive tool is beekeeper’s best friend since it is used for prying the seals open. You will use it to separate the combs from the hive sides, pry frames, cut and also scrape propolis. A premium option hive tool of reasonable size can help you handle all these with ease. A popular choice is one with a knife on one side and the traditional hive tool design on the other. The hive tool serves well anyone irrespective of whether you have a Warre hive or Langstroth foundation free hive. The hive tool is ideally 9 to 10-inches in length. You have to choose one based on your preference. 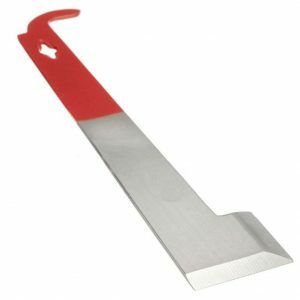 One may feel that the 10-inch hive tool is too long and for others this seems to be a best choice. That notwithstanding both sized hive tools will serve you well in terms of their functionality. Some beekeepers use a screw driver in the place of the hive tool but this is not wise since it destroys the hive. Buy two or three hive tools suffice since you may misplace the tool given its size. The design of the hive tool is similar across all brands. Ideally it has one shinny end and another end has a hook. The sharp and shinny end is used for separating the parts of the hive that are stuck together. The hooked end of the hive tool helps in scrapping off propolis. This helps prevent propolis from accumulating in the hive and thus keep the hive clean. The hive tool also has a small hole which is used for removing nails. There are many other uses of the hive tool as well. Check out BeeKeepClub’s rankings of the best hive tools available to get you up and running. 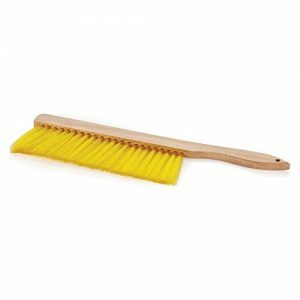 This is a useful tool for gently moving the bees off the comb or any other place you do not want them to be. You should use the brush only once in a while since the bees dislike it and tend to sting it ruthlessly. Bee feeders are essential in beekeeping any time of the year especially during high energy demands and when nectar is insufficient. Bees require feeding during winter and summer months. You can use entrance feeders though these attract food robbers. 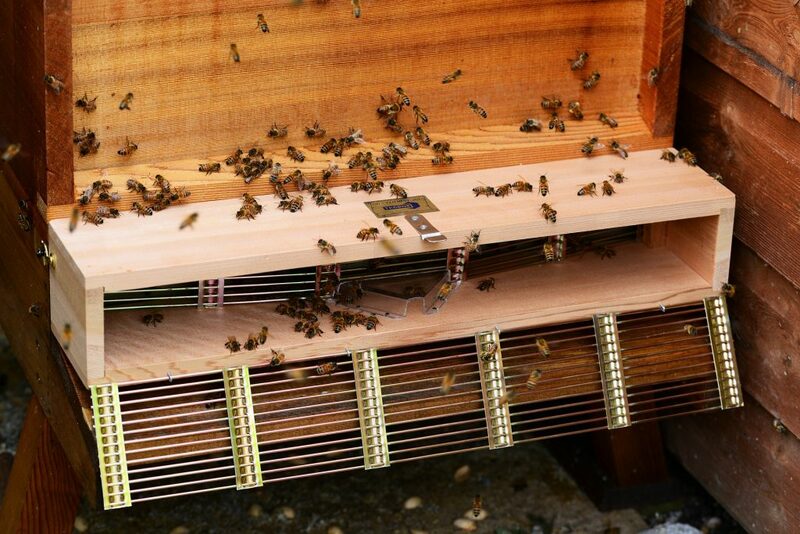 You may also use a division board feeder which normally takes the place of a brood comb and lies close to the clustering bees. It is however important to include folded hardware or floats so as to prevent bees from drowning. Since beekeeping is ever changing, it requires plenty of research, books, flexibility, and patience. It is also important to understand that every honeybee colony is independent and distinct. Therefore, every colony should be handled appropriately hence the need for continuous learning and unlearning. This is certainly best way to guarantee success in keeping of bees. A broad knowledge about bees will help the beekeeper understand best practices and ease decision making. 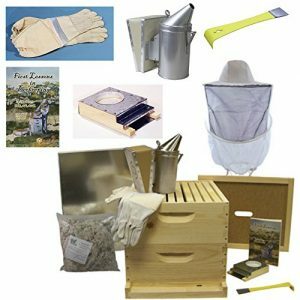 One of the best ways to get a complete package of beekeeping tools and equipment is by buying a beekeeping starter kit. You will get a complete unit that has all you need to get started in beekeeping. Various suppliers such as BuildaBeehive , Mann Lake Ltd, and Goodland Bee Supply offer beekeeping starter kits at affordable prices. You can place an order from any of these manufacturers at their website, Amazon or E-Bay. When starting out in beekeeping one of the most important things to consider is your future anticipation. Do you intend to scale up the business or you simply want to invest a few hives? You also have to know how you will get your bees. Bees can be obtained from an established hive, a wild colony, package of bees sold, or you can capture a swarm of bees. Remember, your first year is always the most challenging with colonies recording a survival rate of less than 30%. Tools and equipment that last longer are preferred. For instance, better a good quality and highly priced hive tool or honey extractor than one that will need to be replaced a few years later. Choose standard hives and hive equipment to make it easy to replace or interchange parts of the hive. An expandable hive unit and parts is preferred over a rigid and fixed design. At times price may be misleading. Some equipment should not necessarily be purchased at high costs. For instance, the hive tool, smoker, bee brush, or hive stand. At times functionality is more important than high price value. Once you have your hive fully packed with the bees, your work does not end there. You have to continually learn. Peruse this website for information, join online forums, subscribe to newsletters, subscribe to Youtube Channels, and buy beekeepers handbooks. All these will help you to perfect the art of keeping bees. It is also prudent to have a mentor if you have just started in beekeeping. Look for a local farmer who is experienced in keeping bees and let him or her assist you. You can even volunteer to work alongside the farmer.